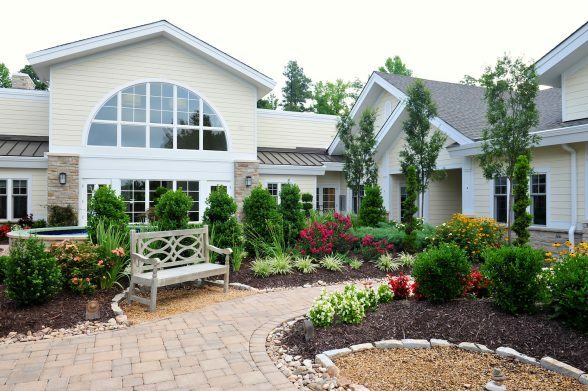 The Community Hospice House is a freestanding 16-bed facility dedicated to inpatient hospice care located on the Southside of Richmond near the intersection of Robious and Old Bon Air roads. The facility offers around-the-clock, compassionate, quality care delivered by our specially trained hospice staff. Each beautiful room has a private bath, access to the outside gardens, and restful space for family members to participate in the care of their loved one. The Community Hospice House initiative is grounded in Bon Secours’ deep commitment to a full continuum of care, a founding element of the Sisters’ ministry, which began in 1824 when the first Sisters of Bon Secours left the confines of their convent and hospital to care for the dying in their homes – an unusual practice at the time. “Hospice is a philosophy of care that values life from the moment it begins to the moment it ends.” – Dame Cicely Saunders, nurse, physician and writer, and founder of hospice movement (1918–2005).